Affordable energy savings. Blowing loose-fill cellulose insulation into an attic can help lower heating and cooling costs by as much as 40%. Cellulose insulation is great for insulating irregular or hard-to-reach spaces, such as unfinished attic. Installing cellulose insulation in your home will help dampen sound for a quieter home and help to get rid of "cold spots." Most cellulose insulation materials are treated with a nontoxic borate solution that makes the material flame retardant and resistant to moisture, mold, and insects. We offer free insulation quotes throughout our Kansas service area, including Manhattan, Salina, Emporia, Topeka and many surrounding areas. Call or contact us today to schedule your free quote! Superior energy savings: Cellulose can be injected into closed wall cavities and other hard-to-reach spaces in your home to increase energy savings and improve comfort. "Green" thermal insulation: Made from 100% recycled paper, cellulose insulation is manufactured using at least 10 times less energy than it takes to make fiberglass. Cellulose contains no formaldehyde. Mold & pest resistant: Designed with a non-toxic, borate-based solution that prevents mold and also discourages termites and other pests. Moisture resistance: If for some reason the insulation gets wet, cellulose will wick water, rather than allowing it to pool and damage your walls or attic. Sound control: Cellulose insulation is proven to reduce sound transmission. Loose-fill or blown cellulose is applied using blowing equipment. This technique is often used when insulating attics. 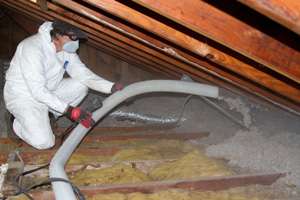 When applying blown cellulose, cellulose is fed into a hopper and blower unit that supplies shredded cellulose through a long hose into the attic space. Cellulose insulation can also be blown into closed wall cavities and other enclosed spaces. Applying this type of wall insulation typically involves drilling 2-inch-diameter access holes to into the cavities, to allow for a small application nozzle to be inserted to inject the insulation. Because cavity-fill applications typically demand greater air pressure and a denser application, this technique is sometimes referred to as dense-pack cellulose. Access holes are plugged when the job is complete. A third cellulose application technique, called wet-spray cellulose, is designed to apply cellulose insulation into open cavities in new construction applications. Water and (in some cases) a liquid adhesive or binder compound is added to the dry cellulose during the application process. The level of wetness must be controlled so that the material is sticky but not so saturated that it will settle or fall out of place. Cellulose is considered a "super-green" insulation material because it's manufactured from recycled newspapers, telephone directories and other waste paper materials. Restore of the Heartland's insulation specialists will help you choose the right type of cellulose insulation for your home. We can repair and restore your property following water or fire damage, which includes installing new insulation. Call us at 1-855-218-6034 or contact us online to request a Free Estimate. We are your local experts for disaster restoration.